I hope this letter finds you well. Thank you for allowing me to continue to share with you what God is doing in my life. For most of you, I've shared this opportunity, and how you can be a part of it. The Evangelical Free Church of America International Ministries originally scheduled the Missions Vision Trip to the Democratic Republic of the Congo (DRC) for October. However, it was postponed due to regional instability and security issues relating to their Presidential run-off election. I'm happy to let you know it has been rescheduled for January 24, thru February 11, 2007. I will be part of the team going on this trip. For those of you I haven't shared this with before, the Tandala hospital (shown right) is a 180 bed general hospital. It has its own nursing school with an emphasis on public health, and caring for the needs of a huge population base. 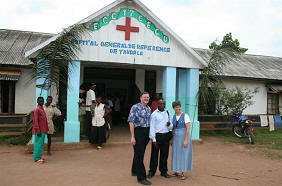 There are two full time Congolese physicians leading the ministry. However, workers are needed in almost every area for short or long periods of time. I'm looking forward to visiting the hospital and spending several days working there. This will help me get a better idea of what their needs are and how we could possibly partner with them in ministry in the future. This is where you come in... again... If you haven't done so already, would you consider partnering with me in this mission trip? Many of you have already indicated that you will support me; and I greatly appreciate it. It means a lot to me that you believe in the work God is doing in and thru me. My needs continue to be two-fold - prayer support and financial support. I still covet your prayers as that region of the world continues to be unstable, thus the need to cancel and reschedule. This trip will not necessarily be easy either. We will be going into enemy territory. This is not a vacation or a safari like tourists take. We are going to the region with the intent of doing battle. I would also like you to pray about supporting me financially if you haven't done so already. Due to changes in the travel arrangements, the cost of the trip is now approximately $3,500.00. This covers airfare, my visa and other travel documents, travel insurance, meals, lodging, and other group travel. I will be responsible for my own incidentals. While my support is close to being met, there are additional expenses that you can help meet. If God leads you to support me, and this hospital, financially, your check should be made out to "FEFC" in order for it to be tax deductible. On the memo line put "Congo Vision Trip-Cindy Ellis". You can send the check to me at my home address. Please contact me via e-mail t cjellis66@yahoo.com, and I will send the address to you individually. Include your name, mailing address, and whether or not you need a receipt for tax purposes. Thank you for allowing me to continue sharing what God is doing in I look forward to you partnering with me in this. Soli Deo Gloria!